Favorite Moment: The Love Story was our favorite part. It was funny and brought back many memories. We could not have had a better master of ceremonies than Jason Spencer for our wedding. From the initial planning stages to the actual day of the wedding Jason was amazing. 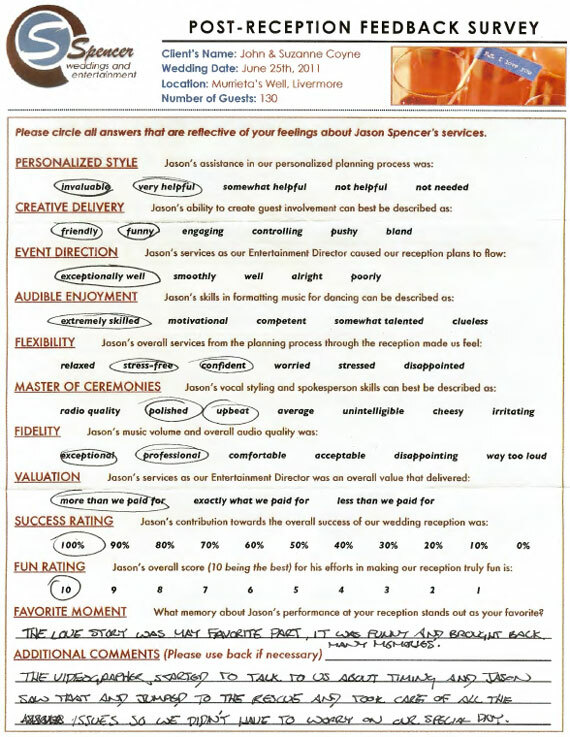 My wife and I had a lot of stress about the wedding like most couples have Jason alleviated that stress through his professionalism and ability to be so organized. The planning packet that he provided made planning so much easier and the song recommendations were invaluable. The day of the wedding could not have gone any better. Everything went smoothly and everyone had such a great time. I was amazed at how many people Jason was able to get on the dance floor. At one point during the reception one of the other vendors started to pressure my wife and I about staying longer to capture some key moments that would’ve cost us an additional amount. Pretty much insinuating that we would run out of time before getting everything we wanted on film. Instantly Jason swooped in to the rescue and took over the conversation with the vendor and got it completely resolved without us having to worry about a thing. The wedding was flawless!